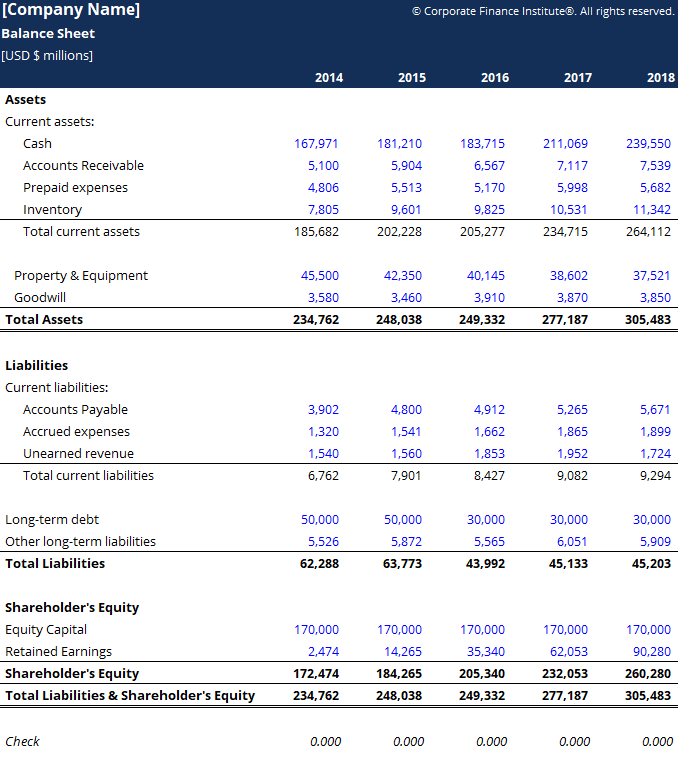 This balance sheet template provides you with a foundation to build your own company’s financial statement showing the total assetsTypes of AssetsCommon types of assets include: current, non-current, physical, intangible, operating and non-operating. Correctly identifying and classifying the types of assets is critical to the survival of a company, specifically its solvency and risk. An asset is a resource controlled by a company which future economic benefit, liabilitiesTypes of LiabilitiesThere are three types of liabilities: current, non-current, and contingent liabilities. Liabilities are legal obligations or debt owed to another person or company. In other words, liabilities are future sacrifices of economic benefits that an entity is required to make to other entities as a result of past events or and shareholders’ equityStockholders EquityStockholders Equity (also known as Shareholders Equity) is an account on a company's balance sheet that consists of share capital plus retained earnings. It also represents the residual value of assets minus liabilities. By rearranging the original accounting equation, we get Stockholders Equity = Assets – Liabilities. The balance sheet is based on the fundamental equation: Assets = Liabilities + Equity. Using this template, you can add and remove line items under each of the buckets according to the business: current assetsCurrent AssetsCurrent assets are all assets that can be reasonably converted to cash within one year. They are commonly used to measure the liquidity of a company. A company’s assets on its balance sheet are split into two categories – current assets and non-current assets (long-term or capital assets)., long-term assets, current liabilitiesCurrent LiabilitiesCurrent liabilities are financial obligations of a business entity that are due and payable within a year. A company shows these on the balance sheet. A liability occurs when a company has undergone a transaction that has generated an expectation for a future outflow of cash or other economic resources., long-term liabilitiesLong Term DebtLong Term Debt (LTD) is any amount of outstanding debt a company holds that has a maturity of 12 months or longer. It is classified as a non-current liability on the company’s balance sheet. The time to maturity for LTD can range anywhere from 12 months to 30+ years and the types of debt can include bonds, mortgages, and equityEquityIn finance and accounting, equity is the value attributable to the owners of a business. The book value of equity is calculated as the difference between assets and liabilities on the company’s balance sheet, while the market value of equity is based on the current share price (if public) or a value. You can then calculate different financial ratiosLeverage RatiosA leverage ratio indicates the level of debt incurred by a business entity against several other accounts in its balance sheet, income statement, or cash flow statement. Leverage ratios include debt/equity, debt/capital, debt/assets, debt/EBITDA, and interest coverage. This guide has exmaples and Excel template to determine how well your company is performing, how liquid or solvent it is, and how efficient it is. One of the biggest challenges in updating a balance sheet is to make sure the total assets and total liabilities & shareholder’s equity amounts match. Using the “Check” line, you can immediately detect unbalances between the total assets and total liabilities & shareholder’s equity amounts and fix the issue!